Live Rock ? What the hec is live rock ? Is that like a Pet Rock ? Live rock is rock that has been collected directly from the ocean and contains many of the life forms that resided on it when it was submersed in the water. These life forms consist of sponges, corals, crabs, shrimps, various algae's, and a tremendous amount of natural bacteria's. It's this life that makes this rock alive. Aside from the many forms of sponges, corals, and crustaceans, which all add to the dynamics of a reef tanks eco-system, the natural bacteria's play a significant roll in the development of a reef tank. These bacteria's provide a large portion of the biological filtration that occurs in the tank. 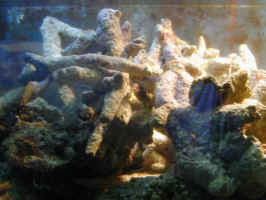 The general approach to a reef tank is to have a wet-dry filter, complete with bio-media, placed below the aquarium. 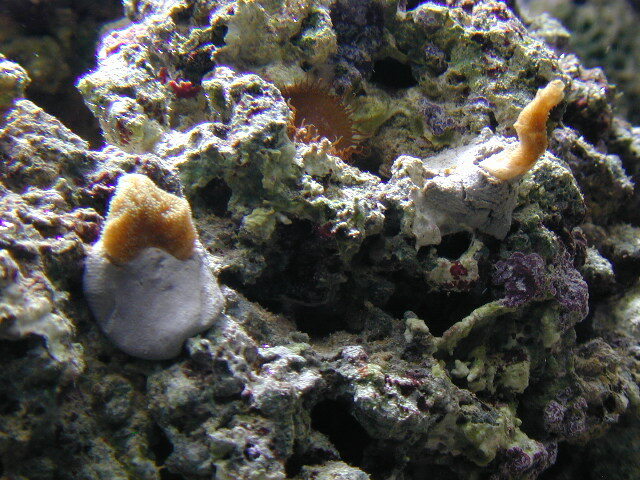 Using live rock in the tank can, in most cases, actually replace the need for the bio-media in the filter ( see Reef Tank Methods ). Live Rock comes from many places around the globe. Today it is imported from Tonga, Fiji, Samoa and the Marshall Islands. 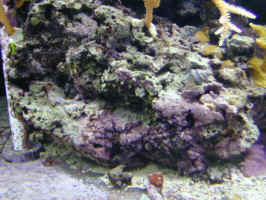 Florida Base Rock was the original choice for reef tanks but due to passage of State and Federal Laws it is no longer available and collection of it is restricted. Picking out your live rock should happen after you've done a bit of thinking. First thing you need to determine the size of your tank. The standard is two pounds of live rock per gallon of tank capacity. By all means, you can use more or less. Florida Base Rock ( no longer available ) was composed of compressed calcareous sediments and coral skeletons. It was quite dense and resembled cement. It usually arrived with a large number of sponges and some small corals. 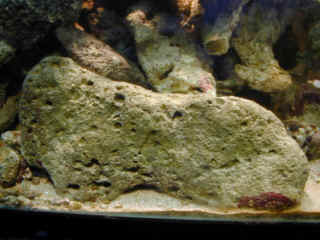 This type of rock was suggested for creating the base foundation of the reef structure. Tonga rock is the branching, pale colored rock. It is composed of old coral skeletons. The rock is not very porous, so I would not recommend using it for your entire tank, only for creating caves and overhangs and for creating height. Marshall Island Rock consists of old coral heads and branches, which are kind of neat because the rock has lots of little crevices for fish to dart in and out and for mounting corals. Fiji Rock is the most common. This rock is very porous which allows for maximum biological filtration. I would recommend looking at a few books that have pictures of coral reefs to get an idea on how you want to construct your reef. Aqua-Cultured Rock is the current 'eco-sensitive' version of live rock. This rock was gathered from terrestrial quarries and placed on the sea bottom. After a period of 1 to 3 years it will become inhabited by the living creatures from that locale. After you've decided on what kind of reef you want, it's time to pick out your rock. 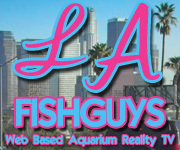 First off, you want to buy some large pieces for your reef base, at the bottom of your tank. These pieces will be the main structure and will need to be very strong. When you choose your pieces of rock, try to smell the rock. If it has a bit of a foul odor, like rotten eggs, then this is because some of the animals that lived on the rock died during shipping. If so try to choose another piece. 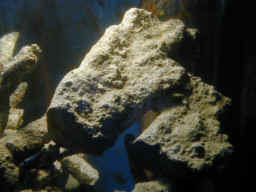 Rock that has this smell, or death, on it is called un-cured rock, and can cause elevated biological levels in the tank. The curing process can be done in a couple of ways. You can cure the rock in your tank, which will allow all the 'die-off' to remain in your tank, or you can use separate containers, like trash cans. If you decide to use separate containers, make up a 5 gallon bucket of salt water, and then make up enough salt water to fill up your trash cans. Take the rock, immerse it in the 5 gallon bucket of salt water and shake it to remove any loose sediment or dead creatures, then place it in your trash cans. After you have placed your rock in the containers, place either strong aeration or strong power heads in the trash cans. This will help the rock shed its debris and provide oxygen to the living inhabitants of the rock. I would highly recommend buying a small protein skimmer to remove organics that will be produced by the curing process as the rock can be poisoned by its own debris. Do not illuminate the rock, this would only encourage algae growth. The rock will take 4-6 weeks to completely cure. During this time, make sure the water level in the trash cans stays stable by adding RO or distilled water. If you don't, the salinity will raise and kill off more organisms than you want. Take your time, don't rush the curing process as this step ultimately determines the future of your reef tank. After you've decided what kind of reef structure you want to build and the rock has been cured, it is time to put the pieces together. This is the fun, or artistic, part. Start off with the large pieces of rock that you've chosen. Try to leave as much space between the rocks on the bottom of the tank as possible, this will allow for good water flow through them minimizing the collection of debris. One thing you want to avoid is to create a structure that looks like a department store shelf. You can cement your rock together by using underwater epoxies and adhesives. For the more intricate structures consider drilling holes in the rock and tie the pieces of rock together with plastic zip ties ( tie wraps or cable ties). If you don't use cement or zip ties, make sure your structure is stable and that it won't come crashing down when you have that prize piece of coral perched on top (or below.) You can double check on the stability of a rock tower by applying slight pressure on it. After you've built your structure, slowly acclimate the rock to the lights, starting off with only 3 hours a day and building up to a full photo period. I would recommend adding Astrea snails and a herbivorous fish like a tangs shortly afterwards to graze on the algae's that will begin to grow once they receive light. 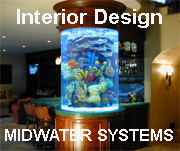 When designing a reef structure use your imagination! So often a reef tank is a collection of rock placed in a manner that it looks like a single slope from the back to the front. Get out your books and find pictures of real coral reefs. Some have out-croppings, pinnacles, shear walls, and valleys. Try to make spots that corals can either be placed on or in to. Above all keep in mind the flow of water that moves around, through, and behind the rocks. Strong water flow will bring the corals food and help them to shed their debris, as well as, decrease the build up of sediments that can cause algae problems.